Provide comfort for the family of Shameka Williams with a meaningful gesture of sympathy. Shameka daughter of Johnnie (Mildred) Williams and Margie (Charles) Spaulding was born March 7, 1980 in Jacksonville, Florida. As a military child, she lived in various places throughout her childhood until she moved to Harvey, Louisiana. at the age of 8. At an early age, she professed her love and faith in Jesus Christ and was a member of Shiloh Baptist Church in New Orleans. 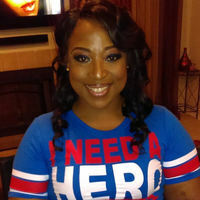 Shameka considered Harvey, Louisiana to be home and graduated from John Ehret High School in 1998. She attended the University of Louisiana at Lafayette and Houston Community College. In 2005, following Hurricane Katrina Shameka and her children temporarily relocated to Orange Park, Florida and were faithful members of the St. Paul AME Church in Jacksonville, Florida. She eventually moved to Katy, Texas where she remained until her untimely passing. Shameka quietly departed this life on Sunday, February 3, 2019 at the Houston Methodist Hospital in Texas. She will be remembered for her beautiful smile, her generous nature and her undeniable love for her family and friends. She believed and trusted in God, His grace and mercy throughout her life. Shameka’s beautiful life will forever be cherished in the lives of her children: Kiara, Gabrielle, Jayden and Jaylen; brothers, Alphonso, Dereck and Kenneth; sisters, Stacy, Robin and Latrice; aunt, Eva; uncle, Elijah; nieces, Nicole, Ericka, Kendra and CaPree; nephew, Kenneth, Jr.; as well as a host of devoted cousins, other relatives and friends. To send flowers in memory of Shameka Tramaine Williams, please visit our Heartfelt Sympathies Store. We encourage you to share your most beloved memories of Shameka here, so that the family and other loved ones can always see it. You can upload cherished photographs, or share your favorite stories, and can even comment on those shared by others. Melinda James and Chuck, Kellye, Lauren & Deneane Watts have sent flowers to the family of Shameka Tramaine Williams. During this time of great sorrow, may you find comfort in knowing that out of great love, God willingly paid for the lifesaving treatment we all need. God sent his only-begotten Son into the world so that by means of Jesus "we will be made alive." (1 Corinthians 15:26;John 3:16) Our deepest sympathy for your lost! My heart is broken. Fly high until we meet again bestie ❤️❤️ I will cherish your memory forever. My prayers and love are with the children and family during this unimaginable time. May God continue to bless you and continue to surround you with HIS steadfast love. The Rhett's, extends our sincere condolences to the family.